The LibTech Desk provides a wide variety of equipment for check out. It is also the go-to desk when students have questions about how to setup wireless on their devices, login to technology in the library, use the equipment available for checkout, and use the one-touch recording studio, as well as scanners and printing. In 2015-2016, the desk checked out 102,753 items and served 80,245 patrons. This proposal seeks funding to increase the number of items available to students for checkout and replace some of the older, failing items that have gotten such a good workout from them. These include iPads, accessories like calculators, chargers, hard drives, and power strips, cameras including point-and-shoot, DSLRs, Go Pros, and a camcorder, and audio visual items like projectors, microphones, a portable PA system and associated cables. Student input on the type of equipment they need and would like to have available for checkout was considered when compiling the list. The John C. Hitt Library is open more hours than any building on campus, giving students more opportunity to use the technology they need to view lectures, complete assignments, do research, take tests, and check out equipment for use in the library and at home. UCF has a large student population that needs technology to navigate their day-to-day academic lives. The technology needed is varied and some of it expensive to obtain. UCF Libraries attempts to not only provide technology for students to borrow and use for their academic pursuits but also, in the case of the John C. Hitt Library, be open more hours than any building on campus so the technology students need is available for them to use. Circulation statistics will measure the frequency with which the equipment is used. Success will be measured by circulation statistics, student demand, and the collection of anecdotal data. Students will be surveyed when they return equipment on user experience including problems encountered using the equipment, and suggestions for improvements to the program and/or the equipment itself. All the equipment loaned by the LibTech desk is entered into the Libraries’ integrated library system and checked out like a book is checked out. Statistics are gathered monthly to measure the usage of all equipment. Those statistics are published quarterly along with other statistics for the Libraries and, ultimately, become part of its annual report. These statistics can be pulled in a variety of ways showing what patron groups check what items out, what the most popular items are by semester, which help to project future trends of usage and future needs. Without a dedicated technology budget, the Libraries relies on technology fee funding to implement new innovations and replace aging equipment. Extended warranties are included in all purchases and obsolescence is anticipated. By staggering purchases, surveying staff and users regularly, and monitoring new technologies, the Libraries keeps current on the technology needs of users. The Libraries’ IT staff support and maintain current equipment and plan for future enhancements. Purchases will be made through the Technology Product Center from several vendors. We have had a purchasing relationship with each of them for several years and find them reliable, prompt, and responsive. 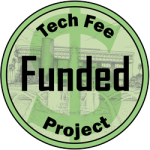 Total amount awarded for this Tech Fee is $32,369.19.